Filtration is the physical process used to separate the particulate and aqueous fractions of a water sample. Samples are filtered for several purposes; for example, to remove microorganisms in order to help preserve ambient analyte concentrations, to remove suspended materials that interfere with specified analytical procedures, and to determine chemical speciation and fractionation of trace elements for geochemical studies. Geotech filters and filter holders are designed and built to the standards employed and recommended by the United States Environmental Protection Agency (U.S. EPA) and the United States Geological Survey (USGS). Their specifications, quality of construction, and performance make them the favorite choice for environmental professionals and government agencies around the world. 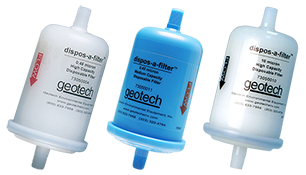 The Geotech dispos-a-filter™ is a disposable, self-contained filter capsule composed of a filter medium encased in a polypropylene plastic housing that can be connected in-line to a sample delivery system, such as a bladder or peristaltic pump. Different pore sizes and capacities are available. Geotech geofilter™ Flatstock Filter Membranes are used in plate-filter assemblies for trace metals analysis of water. Geotech Flatstock Filter Membranes are designed to be used with Geotech inline filter holders. The uniform pore size, and minimization of adsorptive losses from the sample improve the precision and accuracy of the analytical data. Many materials, pore sizes and diameters are available. Geotech builds filter holders in a variety of materials compatible with different chemicals and metals. Our filter holders are designed for rapid filtration of water samples in the lab or field, and accommodate filter membranes 47mm to 142mm in diameter. Geotech Polypropylene and Polycarbonate In-Line Filter Holders are compatible with a wide range of chemicals. The low cost Geotech Aluminum In-Line Filter Holder is ideal for organics and pesticide testing. Geotech Acrylic In-Line Filter Holders are recommended for trace metals analysis. 102 mm and 142 mm filter membrane size versions are available. When a power supply for pressure is unavailable and in-line filtration impractical the manually operated Geotech Barrel Filter Holder is the ideal solution. It uses a 0.45µm, 102mm diameter flatstock filter membranes. Geotech Stainless Steel In-Line Filter Holders are made from #316 stainless steel and designed for autoclaving when used for organic analysis. 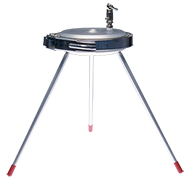 The Geotech PFA In-Line Filter Holder is designed for filtering small volumes of sample water for organic analysis. Wetted surfaces are made with PFA fluoropolymer for maximum chemical compatibility.